That is what my dad calls this. The bringing in of washing that should be in the laundry into another part of the house to dry. 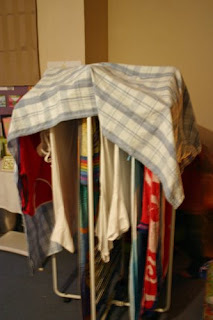 I usually have this drying rack out the back door under cover, but outside the house. It seems to have rained everyday since last Thursday so nothing is really drying & everything feels damp. What better way to dry things than to bring them & place them in front of the fire? I've had the fire going everyday so why not help on electricity costs of running a clothes dryer & just dry them a bit in front of the fire first? Luckily Scott doesn't seem to mind having these clothes sitting in the main room. Sounds like a good idea to me! Love the look of your blog!